Wat is dit voor site? Wij zoeken de goedkoopste boeken op internet. 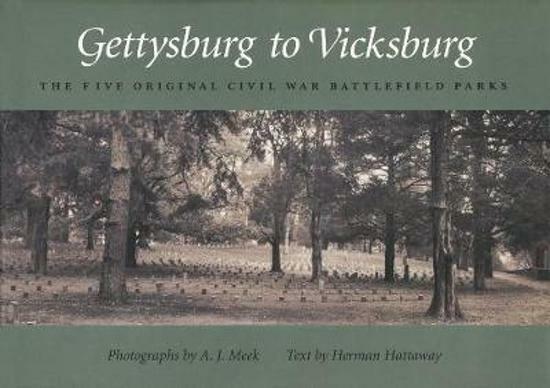 Gettysburg to Vicksburgvonden we het goedkoopst op Bol.com voor €54.99. We hebben gezocht in nieuwe en tweedehands boeken. Rechtsonderaan de pagina kan je het boek direct bestellen	via Bol	.com. Splendidly written and dramatically illustrated, Gettysburg to Vicksburg is a stunning pictorial history of the first five Civil War battlefield parks: Gettysburg, Shiloh, Antietam, Vicksburg, and Chickamauga. Renowned photographer A. J. Meek brings the battlefield parks into vivid focus with more than one hundred memorable photographs, while noted Civil War historian Herman Hattaway provides a brief history of these major battles and of the formation of parks on the battlefield grounds. Through his striking photographs, Meek provides inspired glimpses of personal vision and historical significance, guiding the reader through the settings for the battle narratives. He also shows how the battlefield grounds are different today, as trees and grass cover hills and former breastworks. Hattaway provides critical insight into the personalities and achievements of military leaders on both sides. He also offers extensive descriptions of the events that took place before, during, and after each battle, explaining the significance of each encounter within the larger conflict between the Union and Confederate armies. In addition, he describes what happened to the battlefield areas long after the fighting ended, as the government, veterans, and private organizations wrestled over how the actual grounds - and in some sense, the memory of the soldiers - should be preserved. Much more than a handbook, Gettysburg to Vicksburg is one of the most comprehensive resources available to battlefield park visitors. With Meek and Hattaway's help, visitors will, at long last, be able to understand fully just exactly what they are seeing. This important new work will make a significant addition to Civil War scholarship and will be welcomed by scholars, students, and Civil War enthusiasts alike.